A subject within nutrition that continues to catch people out in their efforts to switch over to a better diet is sugar consumption, the addictive sweet taste with bitter effects. It is very common to find people seeking a ‘healthy’ option to sweeten their food – some magic elixir that will allow us to enjoy the taste, but not pay the consequence. This is not going to be a blog about artificial sweeteners such as aspartame, sucralose and saccharin. To put it bluntly, they are not a healthy alternative to sugar. They have their own set of concerns and we do not advise their intake. This blog is going to focus on sugar, syrups and other foods used to add a sweet taste to our diet and to investigate whether there is a healthy sugar. Getting straight to the key point, have you heard people refer to fruit as containing ‘healthy’ sugar? This illustrates one of the great points of confusion around the human diet. If something is natural and especially if it is plant-based there is an underlying assumption that it is therefore healthy and good for us. The majority of the world’s sugar production (170 million tonnes in 2016) is drawn from 2 naturally occurring plants, sugar cane and sugar beets. Agreed the sugars are drawn out of the plants through industrial processing, but that does not change the compounds that existed in these plants already. In fact, there are many plants that actually have naturally higher levels of sugar and are much sweeter to taste than cane and beets. Most popular fruits are a classic example of this. In fact many popular fruits today have been selectively bred to increase their sweetness (sweeter foods sell better) and as a result contain more sucrose than the same fruits did just 30 years ago. The key consideration is why would the sugar in commonly consumed fruit be any healthier than the sugar found in cane or beets? Is it a different compound? Simply put, it is the same compound – sugar sweet but bitter! Now before you shout blasphemy, let’s acknowledge that whole fruit will also have some fibre, vitamins and minerals contained within it as well, but does this somehow negate the potentially damaging effects of the sugar component? Certainly, this should at least be questioned in the naturally occurring, higher sugar fruits like mangoes, dates, raisins, apples, bananas, pears, oranges and grapes. It is no coincidence that these same high-sugar fruits are also the best-selling varieties in the supermarkets! More sugar, more sales. Simple formula, but it works. Typical white, refined sugar is scientifically called ‘sucrose’ which is a combination of the basic units glucose and fructose in an approximately 50:50 ratio. Regardless of the source of the sugar, white table sugar, golden syrup, honey, fruit concentrate or whole fruit, the chemistry of the sugar is the same; it is still a blend of glucose and fructose. Glucose and fructose are composed of the same molecular elements as well. They both have 6 carbons, 12 hydrogen and 6 oxygen atoms. However, they do look a little different. Glucose is a 6 carbon hexagonal ring and fructose a 5 carbon pentagonal ring. These different shapes mean that the body has to metabolize them differently. We will get into that in a moment. Over the years these 2 molecules have developed different reputations in relation to health. Glucose has taken the brunt of abuse for disrupting our blood glucose levels, driving up insulin and playing a primary role in the causation of obesity and diabetes. Fructose has historically been branded as healthy because it is known as the fruit sugar. These half-truths have created several pervasive myths around the impact of certain foods on our health. Glucose is the compound that serves as the basis of comparison for every other food listed on the Glycaemic Index. Glucose is traditionally given a value of 100 and then other foods are tested and have their rate of absorption compared to glucose and given a respective value. Years ago when glycaemic index reached the awareness of the general public it was pointed out that fructose had a very low glycaemic index and therefore must be helpful in maintaining lower blood glucose levels. It was also promoted at the time as being diabetic ‘friendly’. That tag has quickly faded away as research has shown that fructose actually makes insulin resistance, the problem that underlies the diabetic condition, even worse! Following digestion glucose is absorbed directly through the gut lining into the blood stream to be shipped around for use in body cells, especially the brain and nervous system. The majority of glucose that reaches the liver is converted into a perfectly safe storage form called glycogen. Glycogen is used to boost blood glucose when levels have dropped and food is not consumed. Following digestion, fructose is not delivered direct into the blood stream. It is passed up a direct blood vessel between the intestine and the liver call the hepatic portal vein. Fructose metabolism is then managed by the liver and passes through different processes prior to being released into the blood again. It is this transport via the liver that gives fructose its low glycaemic index because it takes longer to impact on the blood. The delayed release into the blood stream does not make it ‘healthier’ just because it takes longer to influence wider circulation. Using glycaemic index to gauge the supposed ‘healthiness’ of sugar is therefore of no value. 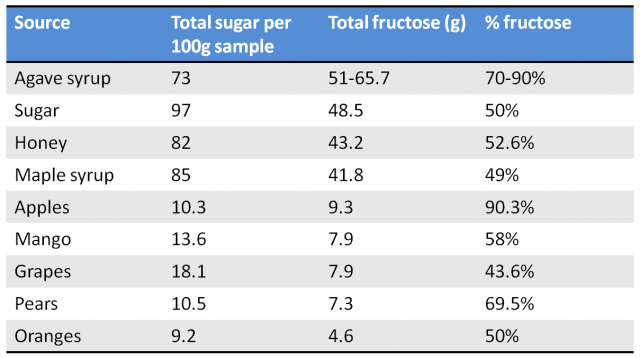 Whilst glucose has a very effective system for ensuring it enters the cells quickly without too many negative effects (it is controlled by insulin), fructose is a more complicated beast. There are several key concerns with the way fructose is managed within the body. Significant amounts of fructose delivered to the liver cannot be metabolized by the cells and get converted to triglycerides (fat molecules that travel in the blood stream). Fructose alters liver enzyme function increasing liver insulin resistance (diabetic tendencies) leading to higher blood insulin and greater visceral fat storage (around the major organs). Fructose undergoes the Maillard (browning) reaction 7 times faster than glucose, suggesting it may increase cellular glycation (sugars binding with proteins), aging processes and cancer formation. High fructose intake has been shown to have many similar effects on the liver as alcohol and can be a factor in non-alcoholic fatty liver disease. Dr. Robert Lustig refers to fructose as the ‘…same poison as alcohol but without the buzz!’ Unlike alcohol, fructose is not metabolized in the brain and as such does not have the same deleterious effects on behaviour. So what about these so-called ‘healthy’ sweeteners used by the side of the food industry that cares? Well you decide. Agave syrup (or ‘nectar’ as it is often called to make it sound better), even the organic variety, is normally between 70-95% fructose. Bearing in mind that the health damaging reputation of industrial high fructose corn syrup (the sweetener of choice for the soft drinks industry) has been built on a 55% fructose blend, it doesn’t really bode too well for Agave. All the negative effects listed above will clearly be enhanced with richer doses of fructose being sent to the liver down the portal vein. Another option often used in health food bars and in supposedly better tinned fruit is ‘fruit concentrate’ or fruit juice. This is exactly what the name suggests, the juice of a given fruit with the water boiled off so as to concentrate the sugars within. This will damage most of the vitamin content leaving primarily a concentrated source of sugar behind. In fact it is not uncommon to find the most used juice concentrates are from apples, grapes and pears as these have some of the highest naturally occurring fructose content and taste even sweeter as fructose has 70% more sweetness than typical sucrose. Simple squeezed fruit juice may not be concentrated, but it still allows for an increased intake of sugar compared to eating a whole piece of fruit. For example, a single apple has a glycaemic index of 40 and a glycaemic load of 6, whereas a glass of pure apple juice has a GI of 44 and a GL of 13 – more than double the volume of sugar within a comparative sized ‘portion’ of fruit. Glycaemic load (GL) refers to the volume or amount of total carbohydrate factored against its glycaemic index. A similar story of raised GL is found with most fruit juices when compared to whole fruit. Therefore, on this basis it becomes difficult to see how pure fruit juice can be considered as beneficial to health as eating whole fruit. Twice the sugar in a single portion will only increase the negative impact on the body and if it is apple, mango or grape juice you will get a hard liver-hitting dose of fructose as well! The fibre in whole fruit, helps to bind and slow the impact of sugar on the body and provides beneficial bulk to the waste products within the digestive tract. Summary – sugar sweet but bitter! So what does all this boil down to? Sugar from any source is still sugar – it is sucrose and/or fructose. Eaten in excess amounts over long periods of time sucrose and fructose will alter blood chemistry, overtax the liver and lead to chronic health problems. Science is steadily showing that processing foods to increase the fructose content has and is leading us further down the road of dysfunction and disease. Added, refined sugars and syrups are having a detrimental effect upon our health with the top 10 global sugar-consuming nations ranging from 90 to 126g per person per day! This is shocking when you consider the World Health Organisation recommendation to reduce added sugars to a maximum of 5% of daily calories. For a male consuming 2500 kcal/day this amounts to 31g of sugar, and for females on 2000 kcal/day this is 25g of sugar as a maximum. This volume of sugar is exceeded by a single can or bottle of common sports or energy drinks. So cut back on sugar-sweetened products…period! Choosing to consume fruit juice doubles our sugar intake compared to eating whole fruit. Even modern breeding of sweeter fruits with higher glucose and fructose contents may yet prove to be another means of ingesting larger amounts of sugar! This is not to say that eating can fruit cannot be part of a ‘good’ diet. Of course it can, but it would be best eaten when it is whole and in moderate amounts. Up to 2 whole fruit portions a day would be a sensible objective. To ensure adequate nutrition it would be best that we place greater focus on a broad and plentiful supply of seasonal vegetables to draw in our needed vitamins, minerals and fibre. It may not be quite as convenient as fruit, but it will support greater health in the long-term.